Second edition of CAMELOGUE now available! Created at and for sale on Blurb.com, $15.00 Canadian; the USD equivalent is less. Now 110 pages, stripped of "fillers" in the first edition. Approximately half the book consists of edited past adventures; the rest is added adventures since 2012. I promise there will not be a Third edition. 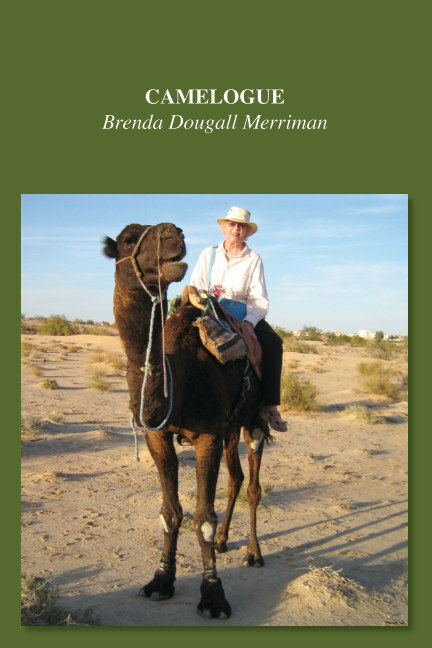 A personal photographic chronicle of chasing camels in Arabic countries encumbered only by gender, age, opportunity, and gentle self-delusion. Impersonating a world traveller requires permanent smiles and sign language on high alert. Strange, the writer's pull to ancient civilizations. Stranger still, baking one's tender body in near-isolated deserts. Highly recommended for lovers of animals and warm climates. Lose yourself briefly here in a different world. "Arabic" is over-stated only in that two of the countries are not. The United States and the Netherlands. Some of the experiences were divine. Others were funny or disappointing with a variety of characters, and just one heart-attack-scary night "hill climb." Brenda Dougall Merriman is well-known as a genealogist for her serious books Genealogy in Ontario: Searching the Records; United Empire Loyalists: A Guide to Tracing Loyalist Ancestors in Upper Canada; and Genealogical Standards of Evidence. She writes about her Canadian, Scottish, and Latvian ancestors at https://brendadougallmerriman.blogspot.com. She also writes about other adventures on her blog CamelDabble TravelBabble at https://camelchaser.blogspot.com.